Todd Gurley rushed for a combined 305 yards in his first two starts. Todd Gurley entered the bye week coming off a pair of dazzling performances. 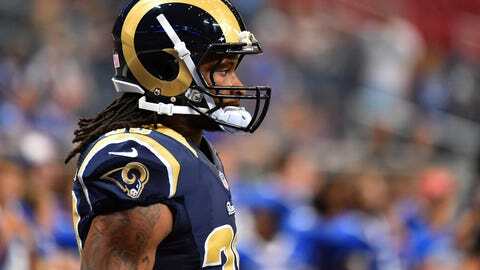 And the St. Louis Rams know the best is yet to come from their prized rookie running back. The No. 10 overall pick in this year's draft, Gurley opened some eyes when he rumbled for 144 of his 146 yards in the second half of a Week 4 win over the Arizona Cardinals. He followed that up with a 159-yard effort in a 24-10 loss at Green Bay the following week. Fisher did not offer an estimation on how far along Gurley in his recovery from a torn ACL, which he sustained at Georgia last November. St. Louis held Gurley out of the first two games as a precautionary measure but the expectations are obviously high as the knee progresses. Jeff Fisher on Gurley in a conference call today: "I don’t think he’s 100 percent yet. I think it takes another year, but he’s special. "